In Italy, cocktail parties are typically scheduled at 7pm, with most guests arriving a fashionable hour late. The array of hors d’ouvres on offer often end up taking the place of cena, or dinner (there’s even a word for this leisurely, festive meal: apericena). 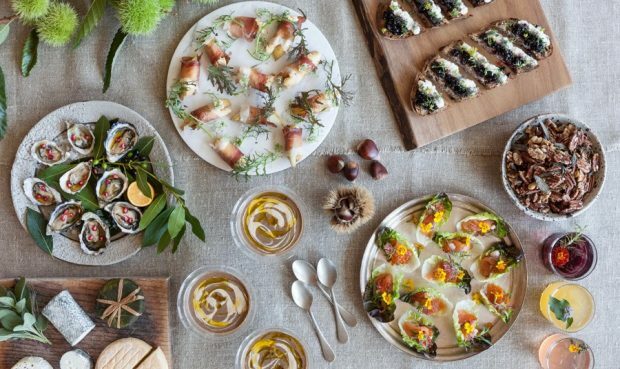 Instructor Viola Buitoni will be joining us for a cooking cocktail party featuring the traditional finger foods of Italy, from the simple to the elaborate. We’ll eat a dinner’s worth of appetizers (and drink aperitifs, of course!) while we learn how to cook, toast, and entertain as artfully and effortlessly as the Italians do. Viola Buitoni was born in Rome and raised in Perugia, Italy. After attending university in the US, Viola she started Buitoni & Garretti, a catering kitchen and Italian fine foods shop in New York City. She later moved to San Francisco where she began giving lectures on Italian food traditions and leading cooking classes with the SF Italian Cultural Institute and Italian Consulate. She teaches Italian cooking workshop around the Bay Area and is a regular contributor of food articles and cooking videos for MissionLocal.org, a UC Berkeley’s School of Journalism blog.